Welcome to Groton Long Point, the best beach community in New England! Summer Beach Fun in a exclusive beach community! offers water views , fantastic outdoor space, and access to excellent amenities that will make this your best summer vacation ever. For guests who like to keep busy, adults will be entertained by an array of activities offered through the Groton Long Point Yacht Club including wine tastings, cocktail parties, tennis tournaments, fireworks and beach concerts. Children can bike to swimming lessons, sailing lessons, or tennis lessons and/or spend their days crabbing off one of the many Groton Long Point docks. At night, they are sure to keep occupied with “kiddy dances”, movie nights, game nights, and many other activities. Excellent dining and shopping are just minutes away in Historic Downtown Mystic and Noank, while proximity to Mohegan Sun or Foxwoods casinos are ideal for those craving nightlife. Prefer something a little more laid back? Take a book to the beach and just relax, bring your fishing pole to one of the piers, or take a short 25 minute kayak ride to a secluded island in Long Island Sound where you can spend a lovely sunny afternoon all by yourselves. 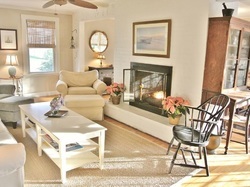 For your stay you will be welcomed into one of the original Groton Long Point homes that has been completely updated for your comfort and includes everything you will need to enjoy a great vacation. 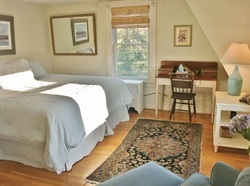 Two bedrooms have King Size beds, the third bedroom has two twin beds. The fourth bedroom is on the first floor with one single bed. Outdoor deck includes gas grill and seating for Al Fresco dining! For the cooking enthustiast we have a fully equipped kitchen with gas range.